Hi loves! So, how about starting the new year with some drab? Sounds lovely, right? Hope you enjoyed New Year's Eve, and here's to a happy, healthy, lucky, joyful 2013! I had a great night at friends, together with my love so that was a great way to kick in the new year :). Now, about the drab. This is Kiko 346 Olive Drab. 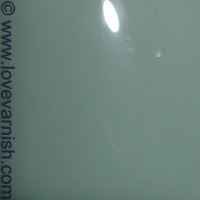 It's a lovely muted saga green creme that applies easy peasy in 2 coats. I think this'll be used as a base for nailart in the future because this color was soooo pretty! I am quite pleased with my first Kiko polish and have another to try too, but this might be the urge for more in the future. Do you own any Kiko polishes? And what is your recommendation or must have? What a lovely creme!! I love it! Happy New Year honey!! What a beautiful color! I really love muted, dusty shades like this. I really recommend kiko 339 Fiordaliso, It's the cornflower one, so gorgeous! This is my favourite Kiko colour (not counting LEs)! I love it. You need the holos, they are gonna be discontinued soon. Esp. the taupe holo, so unique! Kiko 336 is also a great blue jelly. And 255, a purple with subtle scarreted holo! Great color! I've been fortunate to get several Kikos in swaps & like them all. Happy New Year! You too babe, to lots of gorgeous polishes and manicures! And yes, good cremes sometimes are just so nice, classy and simple :). I do too! So sophisticated ♥. I am not sure why I didn't take it home with me while I was there :/.. Kiko reaaaally should open up shop here! I actually did not get the holo's while I was there. The only one I really wanted was the taupe and that was sold out. The rest... Had the colors already in other brands! I'll remember this next time I visit a shop :).